Praise for the hardcover edition: BEST BOOKS 2007, JUNIOR HIGH AND YOUNG ADULTS, ASTRONOMY "Simply put, this book is a real gem." -- Science Books and Films "A glorious vision of the universe." -- American Reference Books Annual 300 Astronomical Objects is a handy and comprehensive reference to the most interesting celestial objects. It takes readers on a photographic tour through the galaxy, from its solar core to its outer limits, stopping to view all the highlights and give the very latest data about the universe. Convenient sidebars with each entry provide up-to-date facts and figures on every object, including mass, magnitude, density, radius, rotation period, and surface and core temperatures. An annotated cross-section of the object enhances this information, and a full-color photograph brings the object to life. Additional spreads bring together and explain related objects and phenomena. For example, the corresponding pages for the sun include solar power, sunspots and solar flares. Others examples include: Mercury and its surface The asteroid belt and 433 Eros Jupiter and its moons, including Io, Europa and Callista Uranus and its rings and moons, including Ariel and Titania Outer belts and comets, such as Halley's comet, and the Deep Impact mission Space telescopes, including the International Space Station. 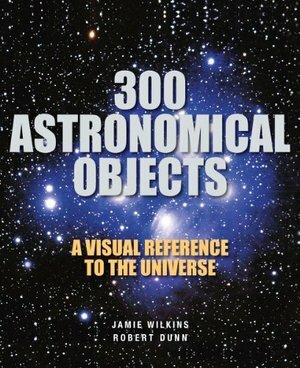 300 Astronomical Objects is a beautiful and handy reference for the amateur astronomer.